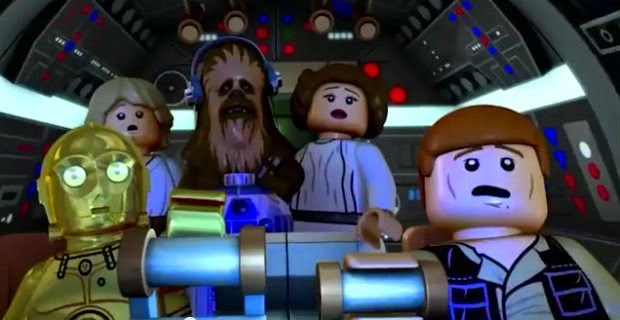 Cartoon Network and Disney's cable network equivalent, Disney XD, have featured over the years LEGO themed television specials called the YODA CHRONICLES that are a fun spoof of the Star Wars space opera. These humorous adventures are a show that my kids and I equally enjoy and it is always nice to be able to watch a show together that everyone in the family likes (yes we even find my wife who claims to not really like Star Wars sitting on the couch with us whenever these shows come on chuckling at the jokes and slapstick humor in them). So we were all really excited to hear that based upon the popularity of the YODA CHRONICLES and the new animated hit series STAR WARS: REBELS that Disney XD to help promote the upcoming feature film STAR WARS EPISODE VII: THE FORCE AWAKENS will be retelling the original six movies in half hour LEGOized tv specials. LEGO / STAR WARS: DROID TALES which will air on Disney XD later this year will consist of five 22-minute episodes that will re-tell the Star Wars saga in chronological order from Star Wars: The Phantom Menace through Star Wars: Return of the Jedi. Taking place in a LEGO universe, Droid Tales will start with R2D2 and C3PO beginning to tell the Star Wars story from their perspective during the victory celebration at the Ewok village on Endor that took place at the conclusion of Return of the Jedi. An accidental kidnapping occurs while the droids are reminiscing and viewers are taken on a new adventure that leads to encounters with familiar faces and places that prompt the retelling of the entire saga. Since we introduced our first LEGO Star Wars set in 1999, we have seen and heard from countless Star Wars fans who have used LEGO bricks to tell their own version of this timeless story, re-enacting favorite scenes and imagining new story lines. LEGO Star Wars: Droid Tales gives us an opportunity to share highlights of the Star Wars story with a sense of humor and excitement that can only be conveyed through the LEGO brick, and will be a fun resource for families as they gear up for the next movie. Keep your eyes peeled for more information about when LEGO Star Wars: Droid Tales will be airing on Disney XD as the countdown for The Force Awakens December premiere begins.